Judίo-German for an oblong loaf of twisted bread, called in some countries also "Taatscher" or "Datscher." 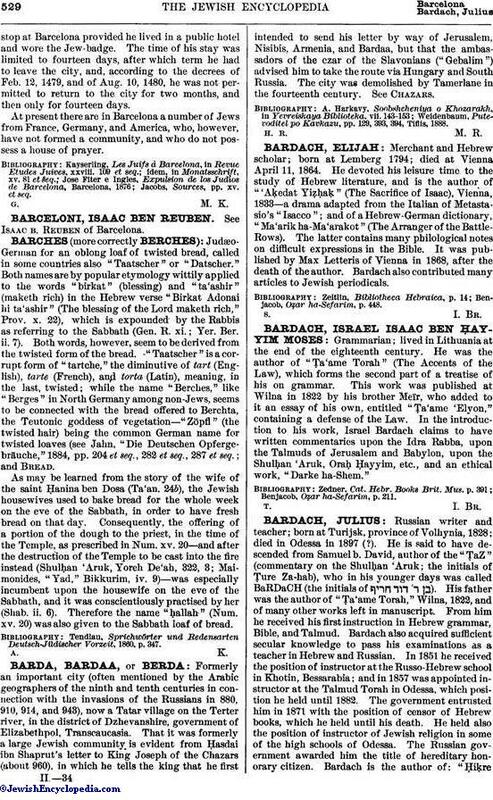 Both names are by popular etymology wittily applied to the words "birkat" (blessing) and "ta'ashir" (maketh rich) in the Hebrew verse "Birkat Adonai hi ta'ashir" (The blessing of the Lord maketh rich," Prov. x. 22), which is expounded by the Rabbis as referring to the Sabbath (Gen. R. xi. ; Yer. Ber. ii. 7). Both words, however, seem to be derived from the twisted form of the bread. "Taatscher" is a corrupt form of "tartche," the diminutive of tart (English), tarte (French), and torta (Latin), meaning, in the last, twisted; while the name "Berches," like "Berges" in North Germany among non-Jews, seems to be connected with the bread offered to Berchta, the Teutonic goddess of vegetation—"Zöpfl" (the twisted hair) being the common German name for twisted loaves (see Jahn, "Die Deutschen Opfergebräuche," 1884, pp. 204 et seq., 282 et seq., 287 et seq. ; and Bread. As may be learned from the story of the wife of the saint Ḥanina ben Dosa (Ta'an. 24b), the Jewish housewives used to bake bread for the whole week on the eve of the Sabbath, in order to have fresh bread on that day. Consequently, the offering of a portion of the dough to the priest, in the time of the Temple, as prescribed in Num. xv. 20—and after the destruction of the Temple to be cast into the fire instead (Shulḥan 'Aruk, Yoreh De'ah, 322, 3; Maimonides, "Yad," Bikkurim, iv. 9)—was especially incumbent upon the housewife on the eve of the Sabbath, and it was conscientiously practised by her (Shab. ii. 6). Therefore the name "ḥallah" (Num. xv. 20) was also given to the Sabbath loaf of bread. Tendlau, Sprichwörter und Redensarten Deutsch-Jüdischer Vorzeit, 1860, p. 347.